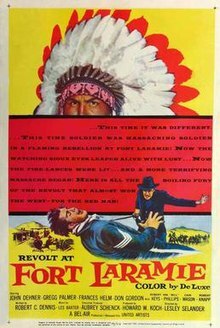 Revolt at Fort Laramie (working title Fort Laramie) is a 1957 Western directed by Lesley Selander and produced by Howard W. Koch and Aubrey Schenck for their Bel-Air Productions that produced second features for United Artists. The film was shot in Kanab, Utah with Harry Dean Stanton making his debut in the film. In 1861 the undermanned garrsion of Fort Laramie, Wyoming Territory are attempting to keep the peace with the Sioux Nation led by Chief Red Cloud. The United States Government pays Red Cloud in gold to keep the peace and support his people, but Red Cloud has the idea to steal the gold and use the non payment as an excuse to go to war. Meanwhile, as the United States face events that lead to the American Civil War, the garrison of the fort is split down the middle in their sympathies, half the men led by Sgt Darrach support the Confederate States of America whilst the other half led by Sgt Serrell support the Federal Union. When the garrison hears about the Battle of Fort Sumter, the Confederate faction not only wants to leave the army, but capture the fort and take the gold shipment due to be paid to Chief Red Cloud to Texas. One of the Southerners warns Captain Tenslip and Lt Waller on the other Southerner's schemes, but he is murdered for betraying the cause with his screams covered by the men singing Dixie. Tenslip is worried that his commander, Major Bradner is a Virginian and may side with the South. Meanwhile, Red Cloud sees the opportunity to split and wipe out the garrison as well as keeping the gold. Parts of the film were shot at the Kanab movie fort and Kanab Creek in Utah. This page was last edited on 2 January 2019, at 22:54 (UTC).